A plate full of shell-packed goodness. I’ve spent a lot of time head down along the north coast searching for the ever delicious red abalone. Whether or not I pried one off the bottom, I still had to eat dinner. Lucky for all of us is that Nor Coast is also home to some of the the finest aquaculture products you’ll ever enjoy. So if you don’t score a few big red’s you can always enjoy some locally raised oysters to fill the gap. Hog Island is the central place for aquaculture up north and they’ve provided us with a great way to enjoy their product. This recipe is a perfect for an afternoon get together or even a formal fiesta. So get a grill, pop a beer, and enjoy a north coast treat. 1. Place the first 7 ingredients in a saucepan over medium heat and bring to a simmer for about 5 to 10 minutes, stirring occasionally. 2. Let the sauce cool and add in the horseradish. Salt and pepper to taste and set aside to let the flavors really meld. 3. Shuck your oysters and flip them in the bottom shell being careful not to lose the brine. it helps to put them on a flat try when your done for transport to the grill. 4. Fire up your grill to high and get ready to lay your shucked oysters. 5. 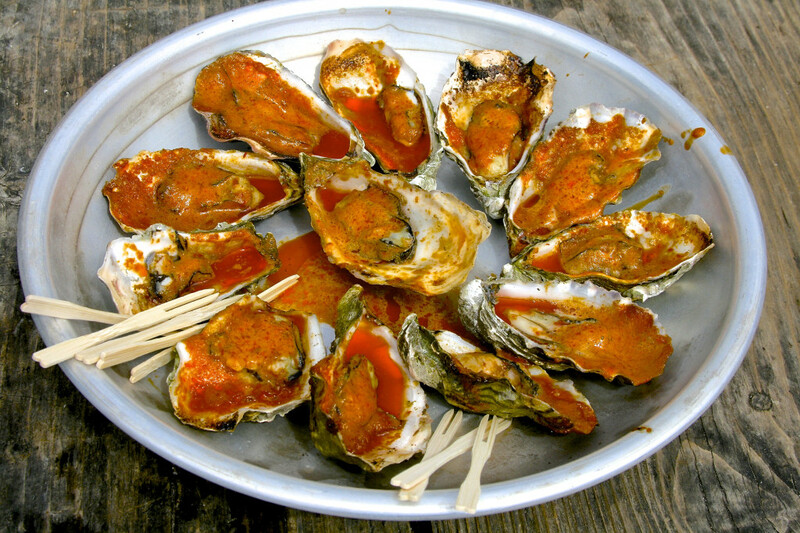 Lay out your oysters with 1 tbsp of the sauce on top and cook for about 5 minutes with the lid down. Some would say it’s a a little spicy, just like the author. I however would say I’m tall and really tasty, just like this recipe. So get to it. You can get great farmed oysters everywhere so make a batch for Memorial Day. You’ll be glad you did. Serve hot with bread and a nice white wine or IPA and make any day a special one.